Written by: Karen on July 26, 2015. The British professor, created by writer Nigel Kneale, was the unlikely hero of three BBC TV serials broadcast in the late 1950s. Because each story was separated by several years, the professor was played by a different actor in each series, but the character remained the same: a fifty-something boffin who had been head of the British Rocket Group, and who, in that capacity, had to deal with alien threats to contemporary life. The Quatermass series were so popular that Hammer Films bought the rights and remade them for the big screen in the 1960s, and they have influenced and impacted British science-fiction for decades. In 1978, Nigel Kneale revisited his character, this time for Euston Films and Thames Television. 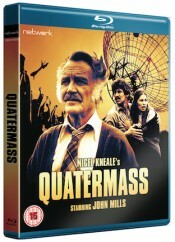 In something of a casting coup, they brought in one of Britain’s finest actors – Oscar-winner John Mills – to play Quatermass, and a BAFTA-winning director, Piers Haggard. Now, courtesy of Network Distributing, a brand new HD restoration of the series will be released in the UK on Blu-ray (RRP £29.99) and DVD, (RRP £19.99) on 27 July 2015. The serial was originally shot on 35mm, allowing for a pin-sharp high-definition restoration of the footage from the original negatives. Add a new 5.1 mix from original triple-track audio elements (presented here alongside the original mono soundtrack), and the only thing to distinguish it from a modern programme is the 1.33:1 ratio. The SFX aren’t up to modern standards, but they’re good for their time, and they’re so sparingly used that they don’t detract from the story at all. Dialogue in the opening episode of the four-part serial makes it clear that John Mills is indeed playing the same Bernard Quatermass who headed up the British Rocket Group years ago – but now, he’s getting on in years and, when we first meet him, is little more than a shell of his former self. Though he’s been brought to London from his Scottish retreat to take part in a live link-up with a US/Soviet space handshake, his main concern is to find his missing 16-year-old granddaughter, Hettie (Rebecca Saire). London itself is a wrecked, threatening place where the TV studios are surrounded by barbed wire and guards, and mercenaries patrol the streets in place of the Metropolitan Police. Gang warfare rages through the remains of buildings and burned-out cars, and the elderly cower underground in fear. Groups of young ‘Planet People’, dressed like hippies and looking deceptively benign as they follow ley lines, chanting and dancing, are responsible for the chaos – North Sea oil lines have been sabotaged, power is rationed, shops have been looted, museums burned down. Above all, the ‘Planet People’ detest science and learning, and are prepared to smash up vehicles, electrical equipment, computers – and people. The youngsters head for ancient gathering sites, and it becomes clear that this phenomenon is happening all over the world. Quatermass follows them, at first to try to find his granddaughter but then, increasingly desperately, to find out what is happening to these young people. Events take a sinister turn when the gatherings of ‘Planet People’ are blasted out of existence by bright lights that appear from the sky. Not only do these ‘lights’ produce shocks for the audience by taking some innocent and empathetic victims; they also play havoc on-screen with electronic instrumentation and communications. Convinced that there’s something malign, something alien, behind all this, Quatermass begins to put the pieces of the puzzle together, aided by astronomer Joe Kepp (Simon MacCorkindale), District Commissioner Annie Morgan (Margaret Tyzack) and a group of elderly scientists pulled out of retirement because they’re too old to be influenced by… whatever it is. The strange, dark, dystopia of Quatermass’s last adventure is leavened with wit, humour and the sort of British stoicism that sees tea and sandwiches as the ideal response to a growing crisis. The Blitz spirit is evoked (though not directly referred to) by the sight of elderly men and women taking shelter underground, sharing a thermos flask and singing wartime tunes. Other shots cleverly contrast beautiful English countryside with armoured vehicles and rusting wrecks. There will also be a Booklet by archive TV historian Andrew Pixley, which wasn’t included in the preview package, but which is likely to contain a look at the history of the series and behind-the-scenes information. The Blu-ray edition will also be available in four limited edition covers (Please see networkonair.com or http://www.amazon.co.uk/gp/product/B0108KZK6K for full details) based on the colour of the title sequence of each episode.